Had both of my front wheel bearings on my 2006 G35x start to fail around 70K miles. Symptons were a constant humming from the front as well as a roughness felt in the steering wheel. Both wheels exhibited ZERO up and down play when I rocked the wheels at 6 and 12 o'clock. To properly diagnose, i removed both front rotors and spun the hubs by hand. With a little pressure downwards, i was able to feel the roughness in both front bearings. At 85K miles, I finally ordered the parts to replace both. i would have done it sooner but the job seemed intimidating. Having done it now, I found it very easy with the proper tools. Hopefully this write-up helps others see what is involved and hopefully saves them a few bucks. A "Thanks" here would be appreciated! Forward: This job isn't that difficult to do. 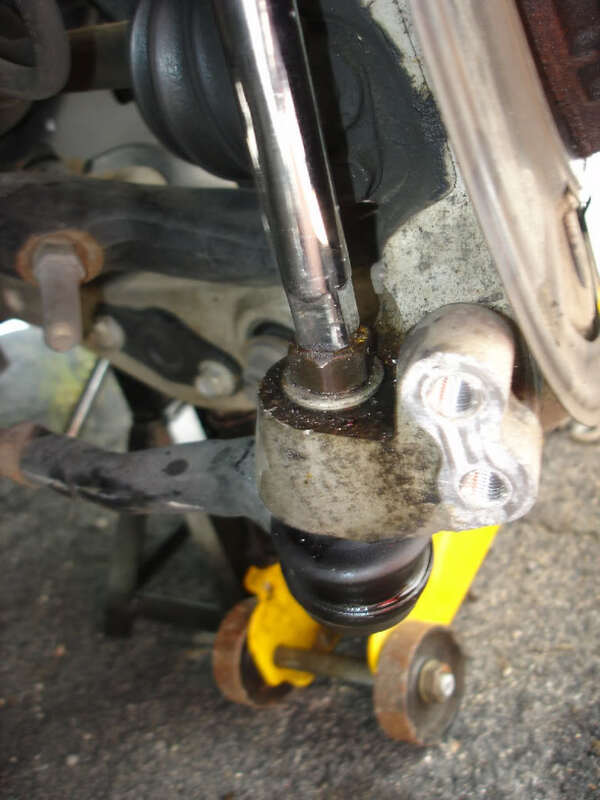 The front suspension is relatively easy to take apart, but since most AWD cars are up north, and experience bearing failures close to 100K miles, chances are there is a lot of corrosion in the suspension bolts and fasteners. Some of you may need to modify your removal techniques based on what you find. I started this project expecting the bearing to fall out once removed, but this was not the case. I tried to remove it with various techniques such as a slide hammer and other creative methods but failed. In the end, i used a press and it took a lot of force to remove it making me think it's the only way to do the job. 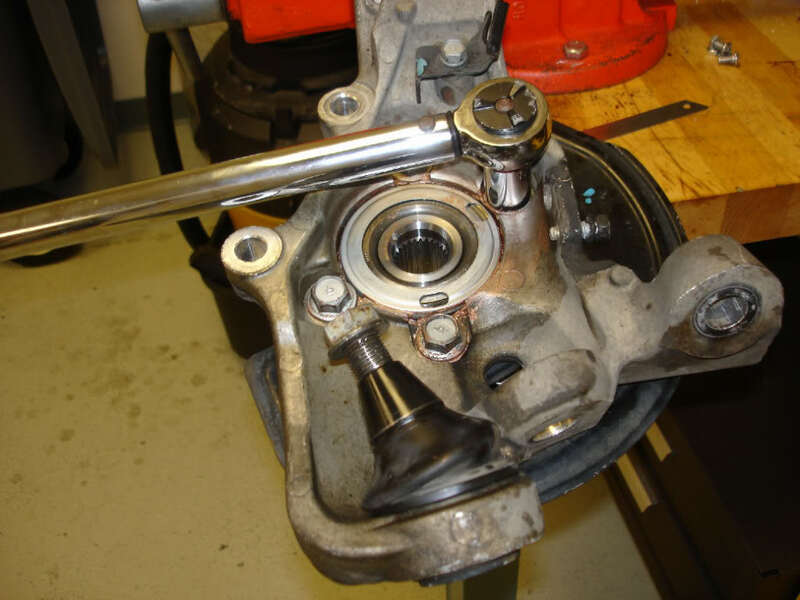 If you are replacing a low mileage or southern car, you may get lucky...but this DIY is based on removing the spindle and pressing the bearing out. Please perform at your own risk. 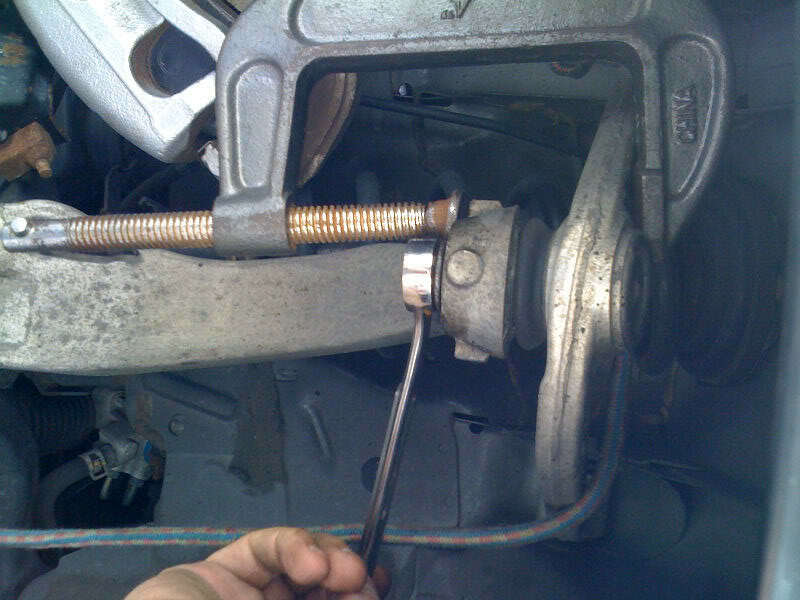 if you are not comfortable doing this, take the car to a dealer or mechanic! Torque wrench capable of 250 ft-lbs. Last edited by Mustang5L5; 01-22-2014 at 12:10 PM. 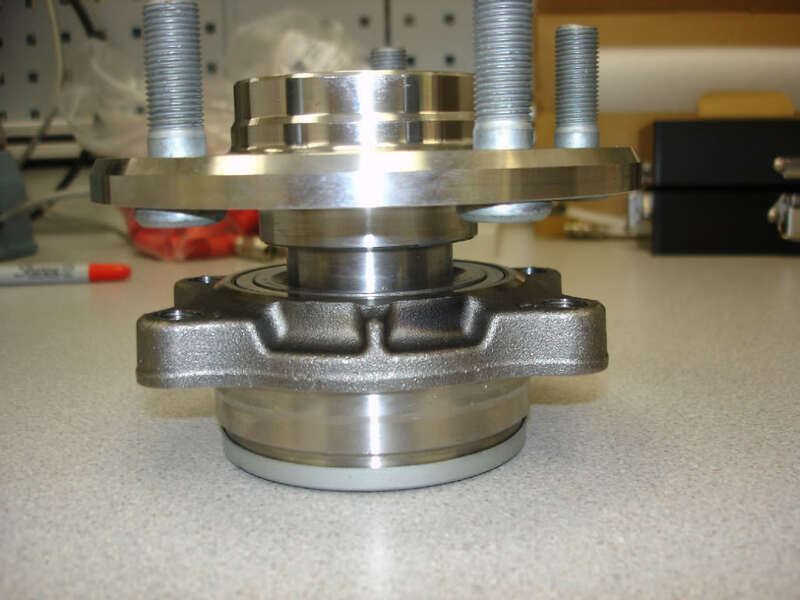 Assuming you have purchased the bearing and hub ahead of time, here is the assembly process. The same applies if you have removed your old hub. 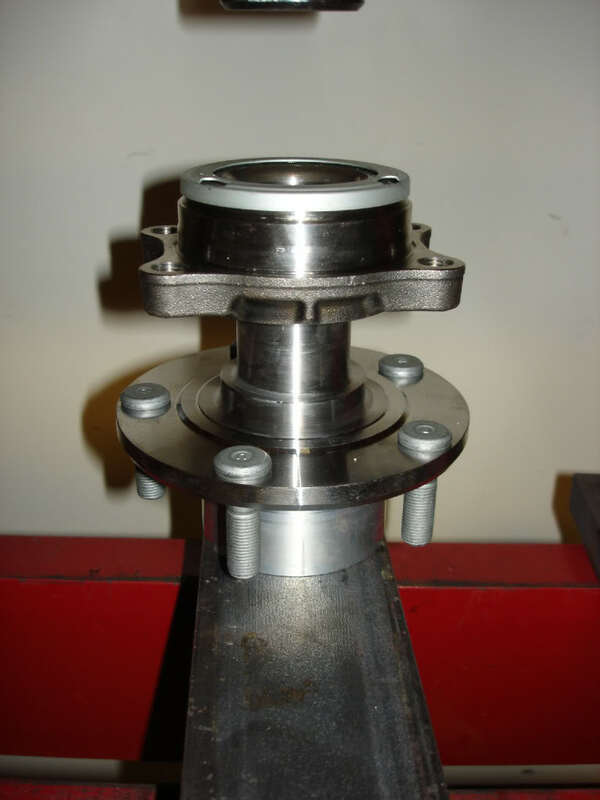 Simply clean up the hub's shaft with some light sandpaper and assemble as follows. IMPORTANT STEP HERE. 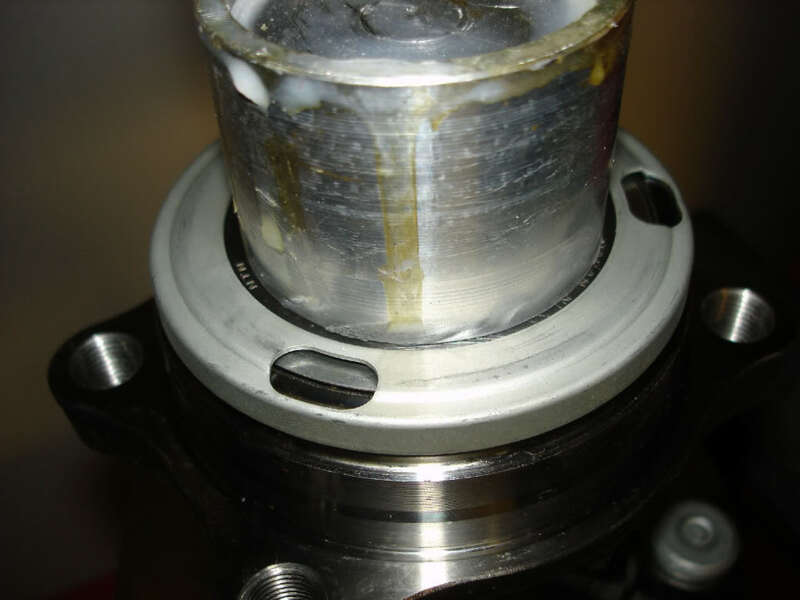 On the top of the bearing you do NOT want to press on the debris shield around the circumference of the bearing. you only want to press on the inner bearing race. You can see my spacer block here is only contacting the center. This is where you want to press down! Last edited by Mustang5L5; 08-08-2011 at 02:10 PM. Park the car on a level, solid surface. Put trans in park, set the parking brake and chock the rear wheels if you'd wish. 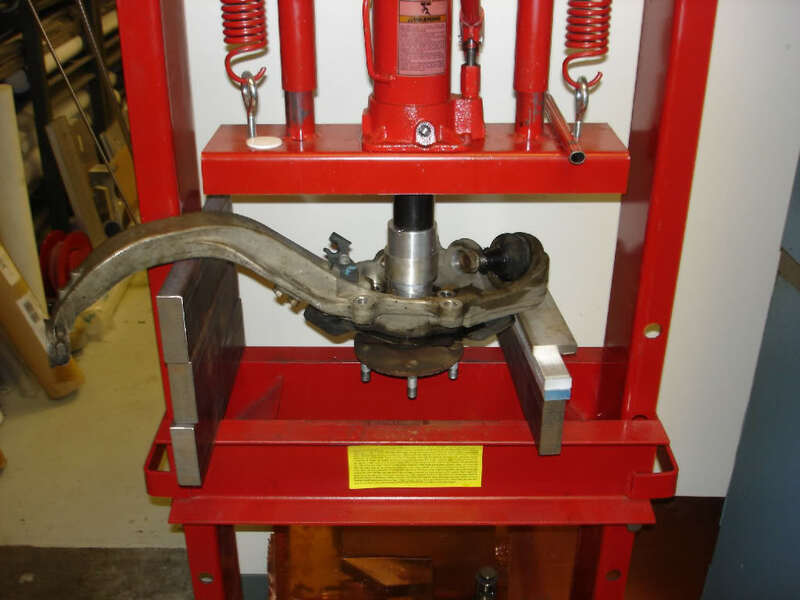 Don't jack up the front end on jackstands yet. 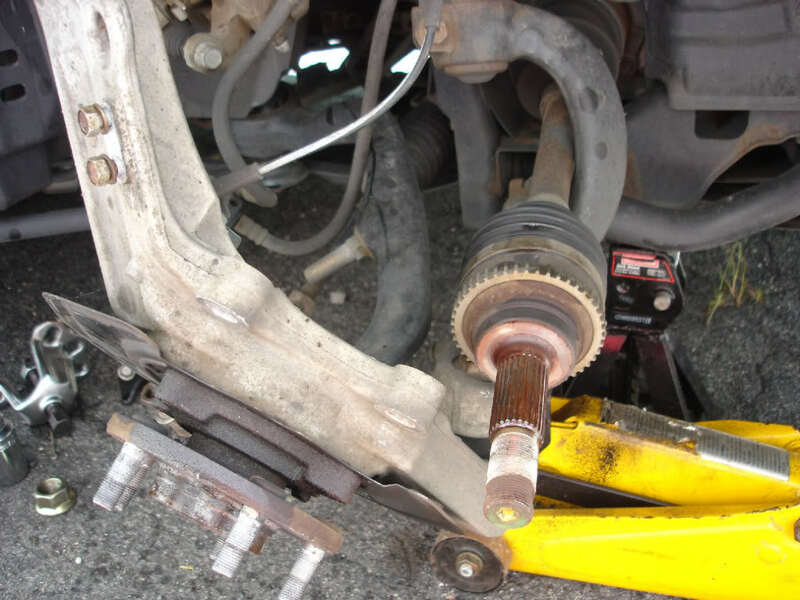 This next step assumes you have no impact gun to break the axle nut loose. If you have an impact, you can skip this, but the first thing i'd do is take the axle nut off. 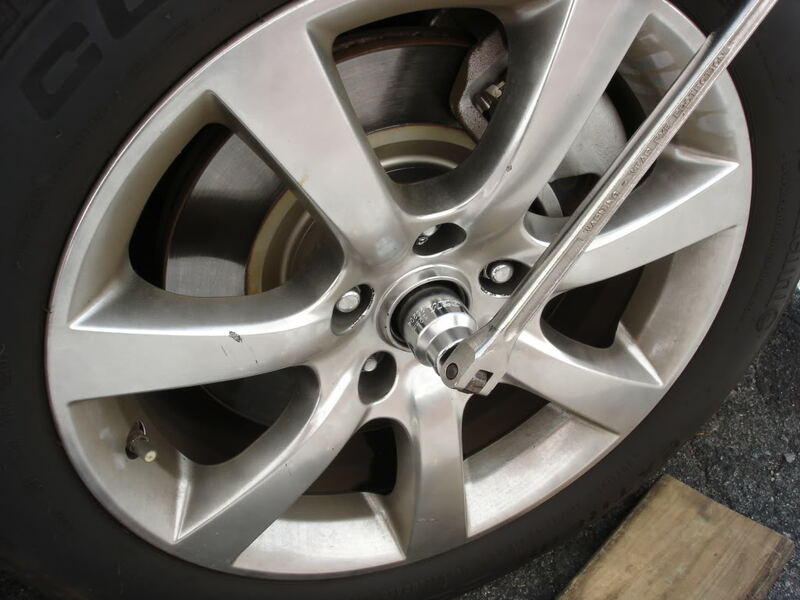 Break the lugs loose on the wheel you are going to work on. Jack up wheel, remove the tire and pop the center cap off. Remove the cotter pin from the cv axle. Put the wheel back on, and lower the car to the ground. Now stick the 32mm axle nut and breaker bar in where the center cap was. You can use a 6" extension, but i snapped mine. So be careful and maybe put a blanket on your fender if you are worried. But in any case, break the nut loose! EDIT. 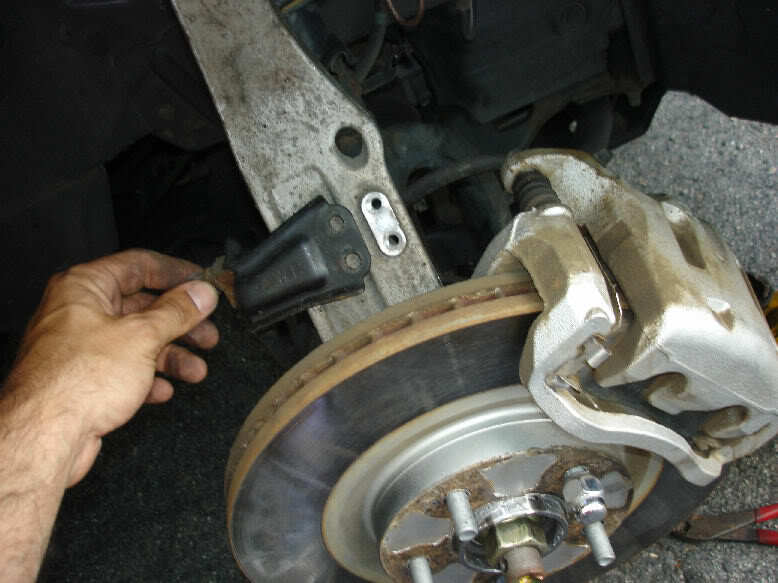 If you have a helper and can't use the wheel method, have them stand on the brakes hard while you break the nut loose. This works if you have aftermarket wheels that the socket won't fit thru. Also, air impact gun will work here too. Once you break it loose. Jack the front end and put both sides on jackstands and remove the wheel. 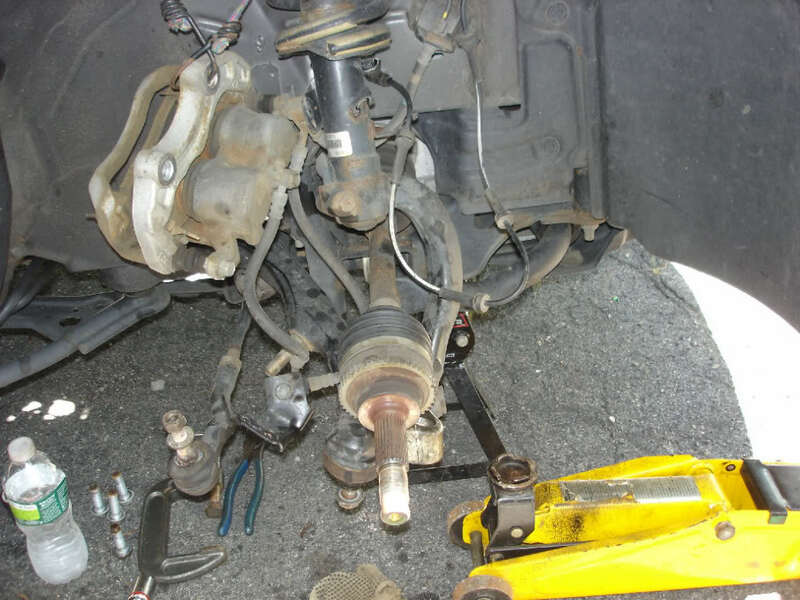 I put my jackstands under the frame of the car where the lower control arms bolts to. Having both sides up will allow you to move the steering wheel and spin the wheels which will be helpful in the following steps. If you had an impact gun, you would just put both sides up on jackstands...and zip the nut off. Last edited by Mustang5L5; 08-01-2011 at 12:01 AM. Next up, lets make some room. The spindle is gonna come out, so some of the smaller parts can be removed. Last edited by Mustang5L5; 07-31-2011 at 10:36 PM. 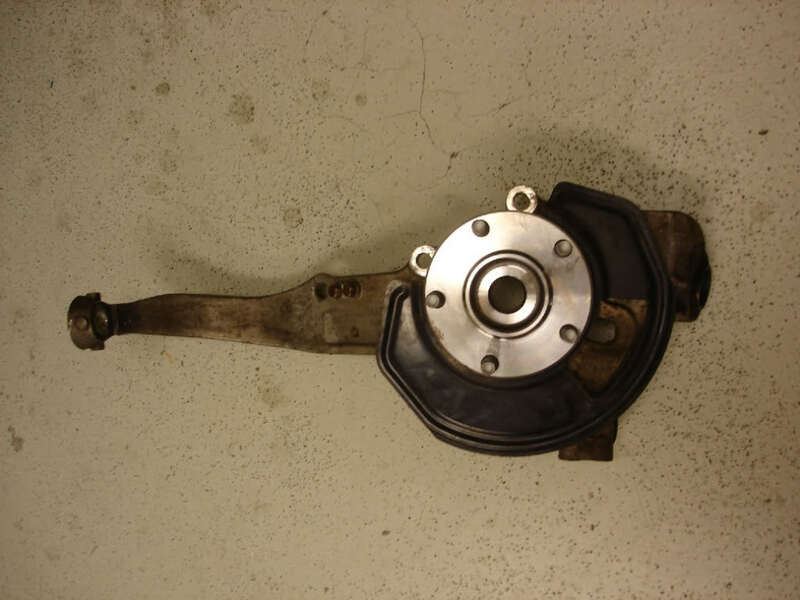 Next up, you are going to remove the brake caliper and rotor. 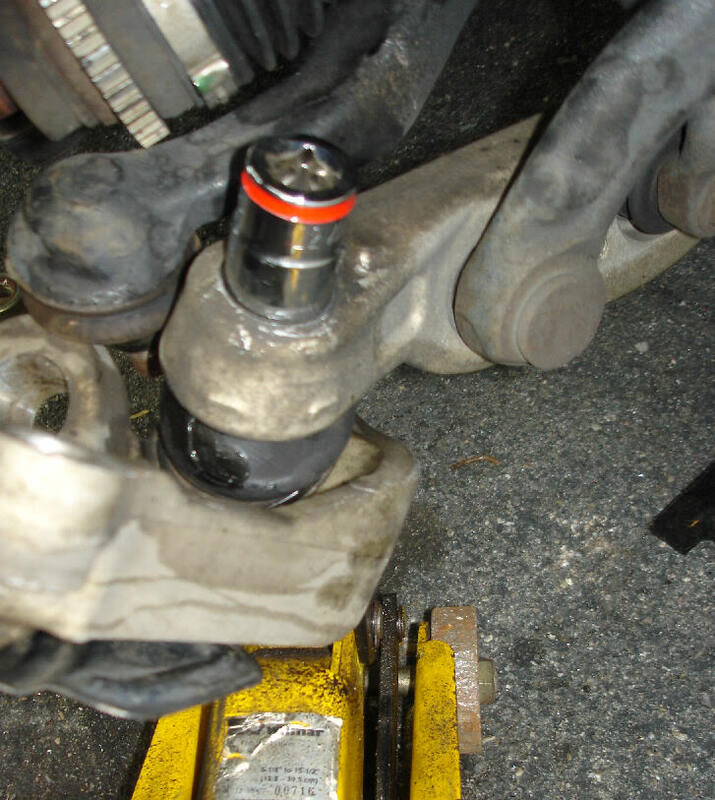 Unbolt the caliper from the spindle using the 22mm socket. If you turn the steering wheel to full lock to the side you are working on, it makes accessing the bolts easier! With a breaker bar, you can crack them off easily. Remove the rotor. 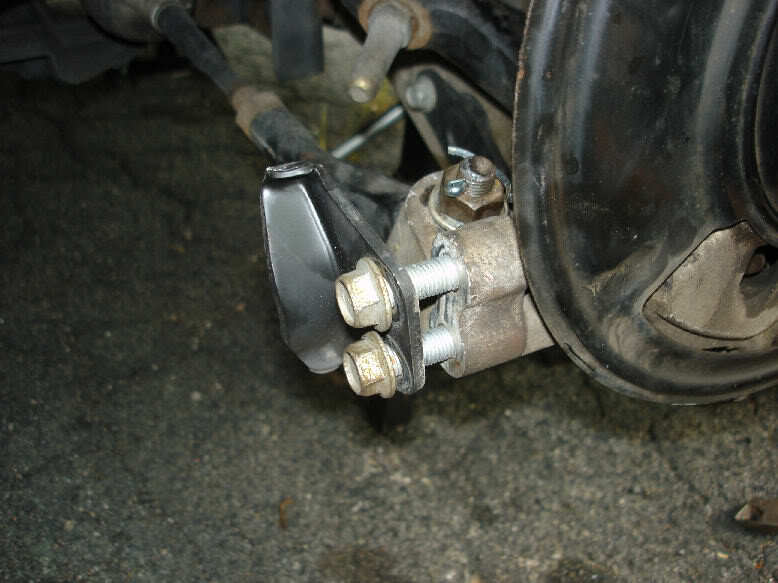 How easy this is depends on if you've done brakes recently or not and if you used anti-sieze. 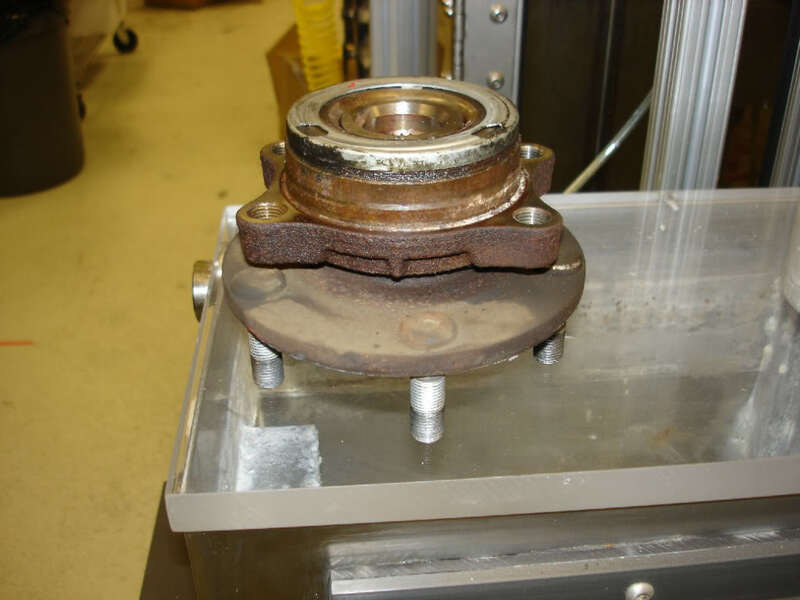 There are various brake DIY's showing how to remove seized rotors. Basically...whack the crap out of it with a 2x4 (so it doesn't damage rotor) or a rubber mallet. Eventially it will come off, and you will have this. Support the caliper by hanging it. 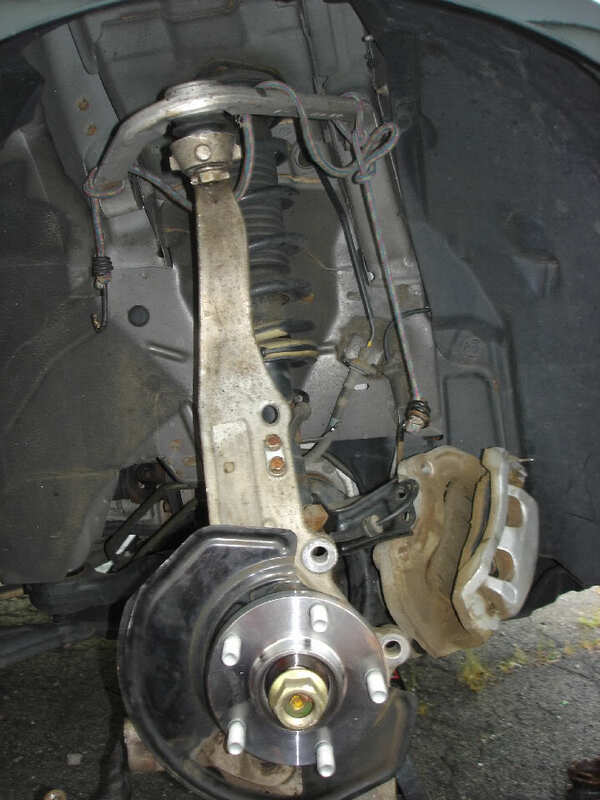 At first, we will hang it towards the front of the car, but when we unbolt the upper link, transfering it to the other side will give you room for what is next. Tip here, use a stiff wire brush to clean the threads up first, then remove the nut. It will make removal much easier! I didn't need a separate to free it from the spindle. 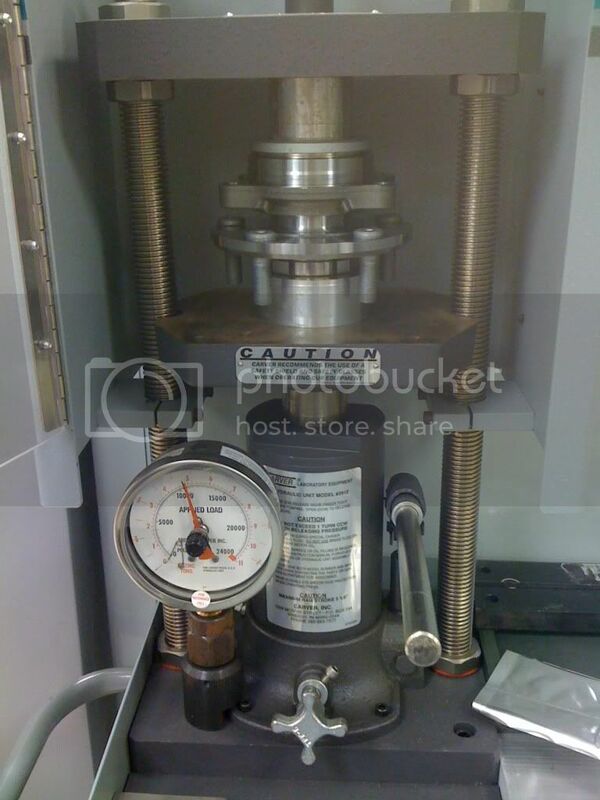 Once i had the nut removed, i placed the nut on the end of the shaft as shown, and put a 1/2 drive extension on top. A couple light taps with a hammer, and it popped loose! 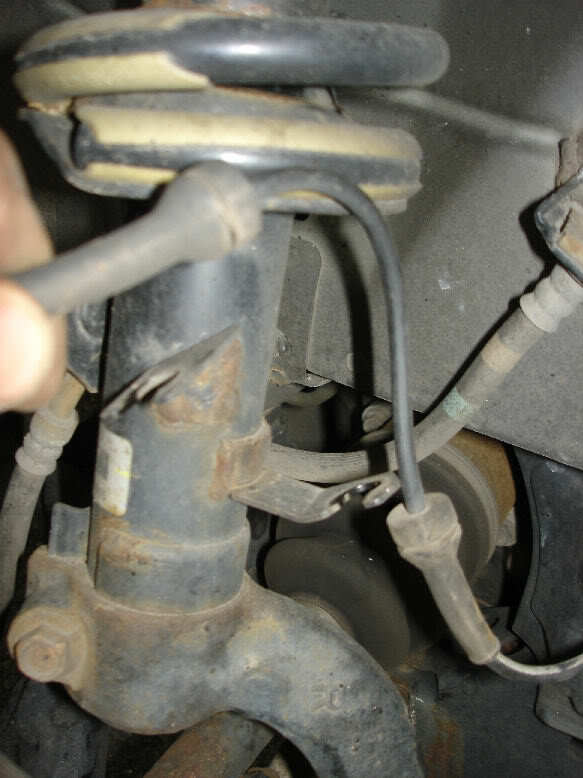 Once free, i turned the steering wheel to pull the tie rod in to get it out of my way and give me more room. Last edited by Mustang5L5; 08-16-2011 at 08:52 PM. 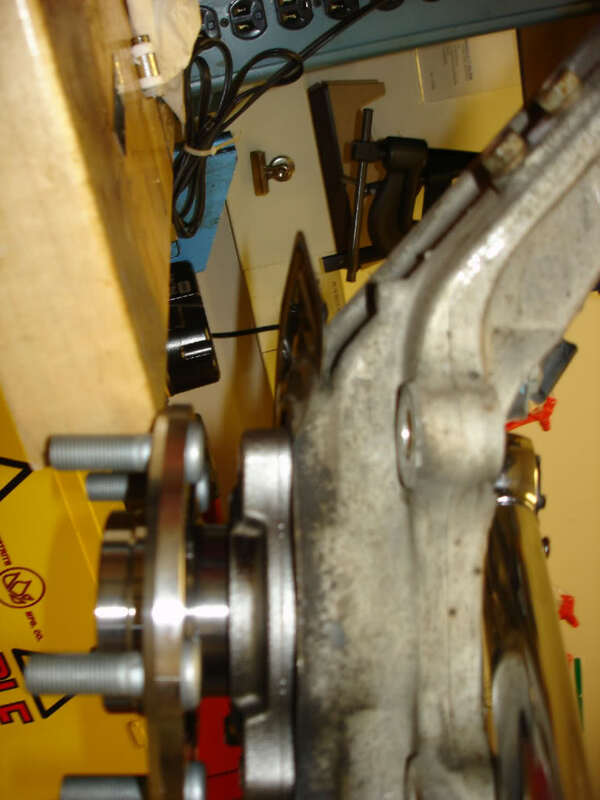 Next, we get to remove the upper control arm from the spindle. Remove the cotter pin. This was a 17mm socket i believe. 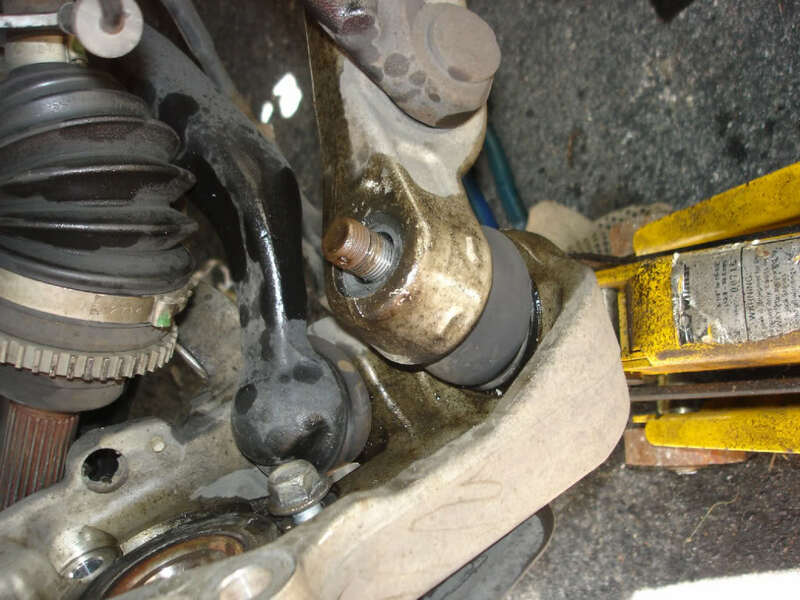 You may find that once the nut breaks loose, the entire ball joint spins. If this happens, use a clamp to put pressure on the spindle to the upper control arm and that should stop it from spinning. Again, a stiff wire brush to the threads can make this easier. Also, if you have air tools, the nuts will prob zip right off. 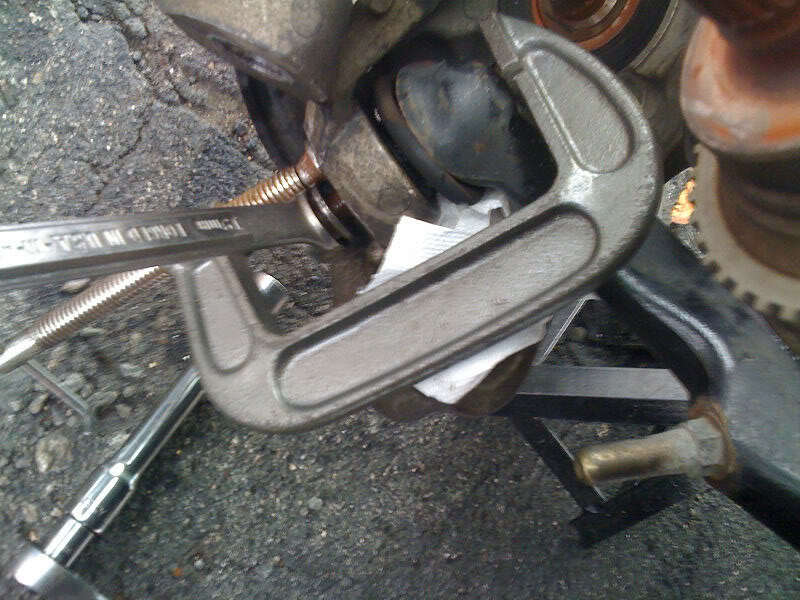 If you can't separate the joint, a Pitman Arm Puller from Autozone will do the trick. I found mine was easy to separate. A good blow with a hammer on the stud (with nut threaded on end first) probably would have been all that was needed. Last edited by Mustang5L5; 08-16-2011 at 08:51 PM. With the upper link undone, you'll find you can now pull the spindle outwards slightly. 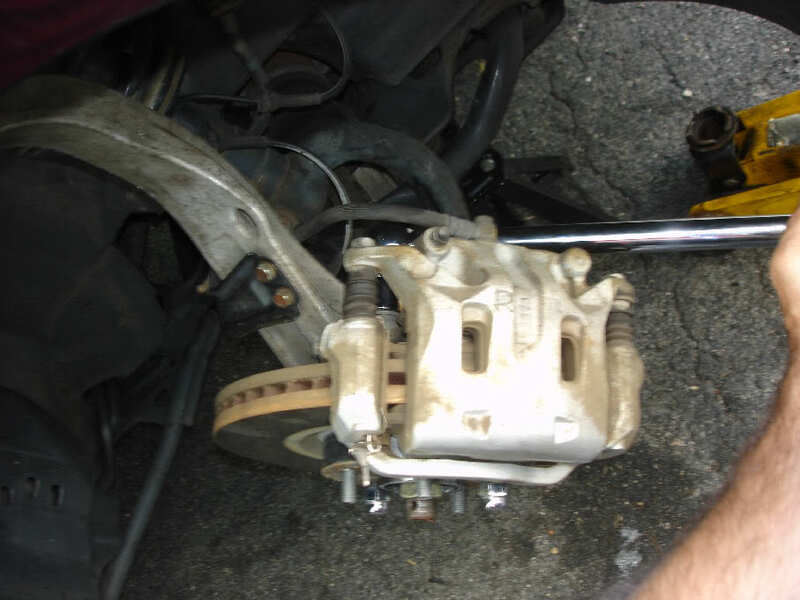 At this point, move the brake caliper over to the other side. Now, we will push the axle out of the hub. 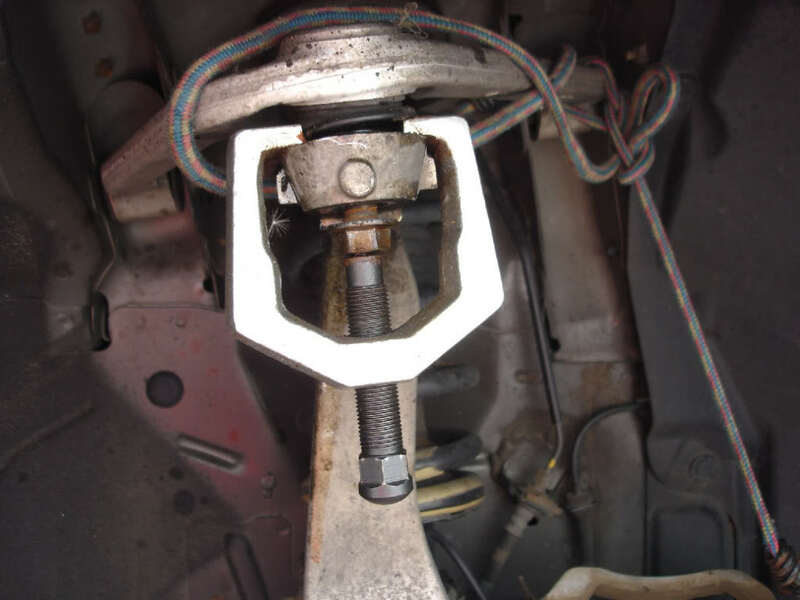 I rented a FWD axle puller, but you can also use a 3-jaw puller here. It's simple as pie. 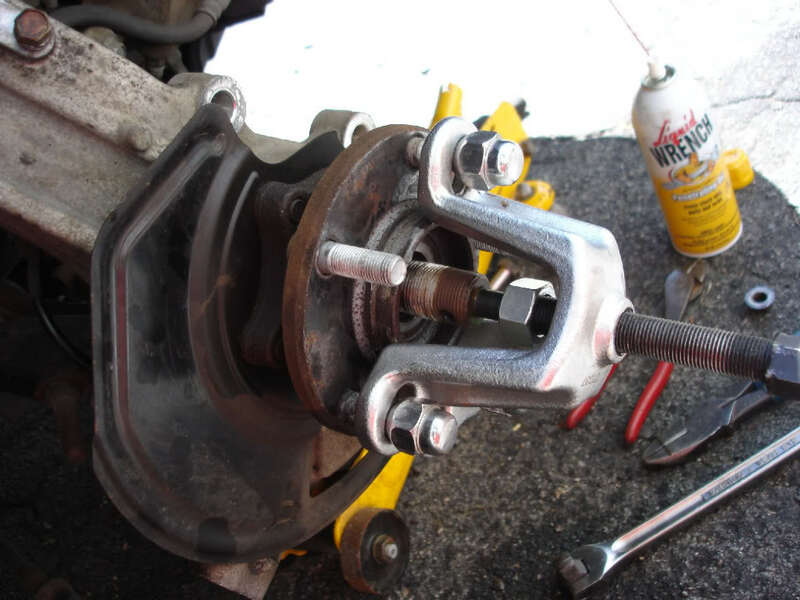 Use 3 lugs to secure the puller to the hub. Don't tighten the lugs too much or you'll stick the puller to the hub. Just thread them on until the hub is bottomed out on the face of the hub. You'll be able to pull the axle out towards the front of the car. This popped out so easy, that a few hits with a rubber mallet would probably have freed it. Be careful you don't mess up the threads. That's why the tool shown below is a better idea. Last edited by Mustang5L5; 08-16-2011 at 08:53 PM. You can see the issue with the bottom bolt here hitting the compression rod. If you are continuing on to remove the spindle, here we go. 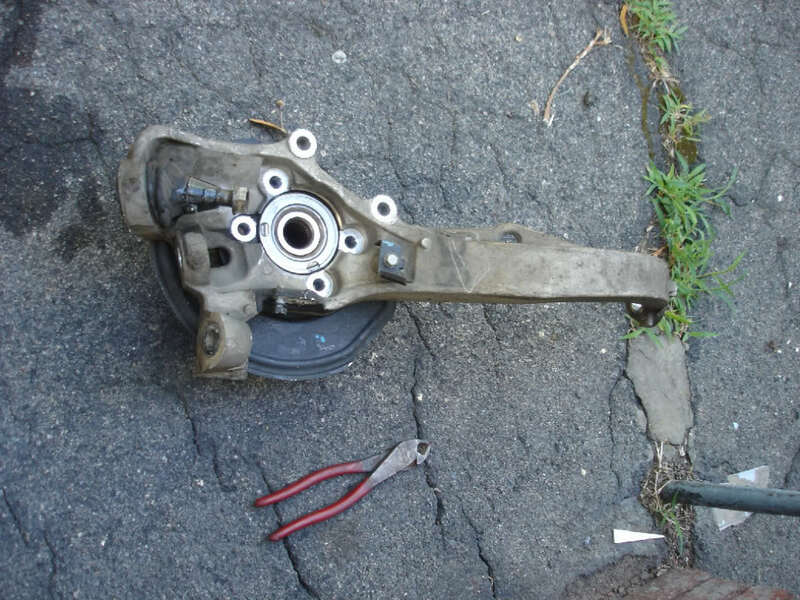 Once removed, the spindle separated easily from the lower control arm. No need for any separator. 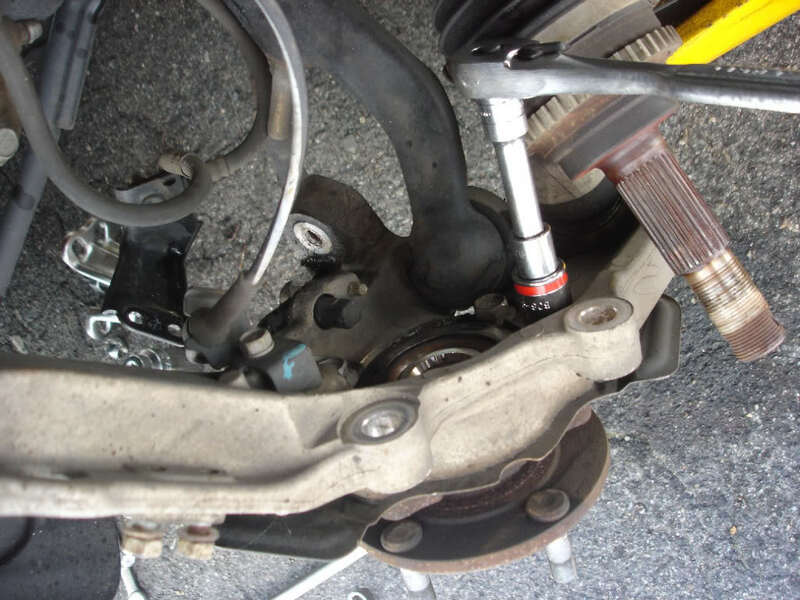 Finally, remove the cotter pin and remove the nut on the compression rod. Wire-brush and penetrating fluid will come in handy here again! 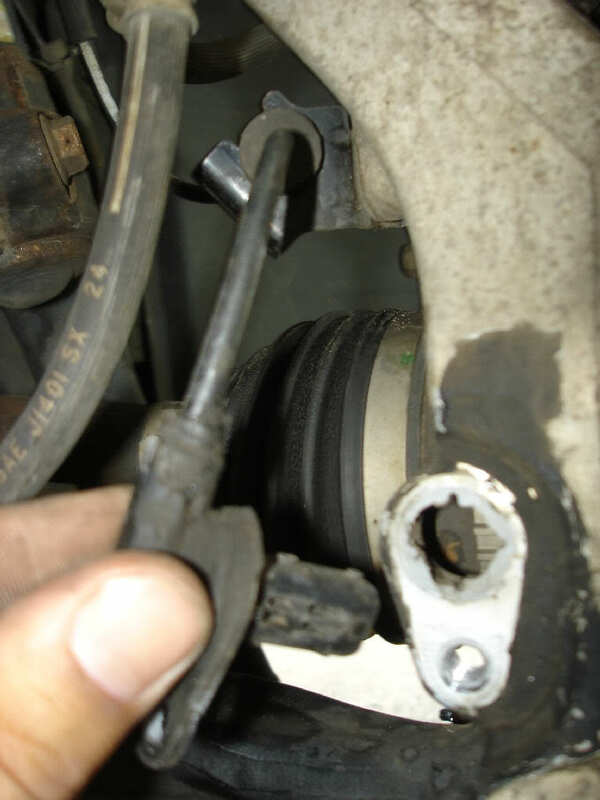 if you find the balljoint is spinning, use a c-clamp to clamp between the compression rod and spindle. Then remove the nut with a wrench as you might not be able to get a socket in. Light pressure will seat the joint and allow you to remove the nut. With the compression rod undone, pull the spindle out. This is what you should be left with! Remove the bearing bolts now if you haven't done so. A little brake cleaner will help clean up all the penetrating fluids you prob sprayed everywhere and keep the spindle somewhat clean for the next step. Last edited by Mustang5L5; 08-02-2011 at 11:05 PM. Hopefully you have access to a press, or know someone with a press, because you'll need it. This is how i set up the press. I used spacers under the upper end and lower end just short of the dust sheild. Don't rest it on the shield, you will bend it. The spindle is forged aluminum...which is very strong. But do NOT use heat on it or you will weaken it. Penetrating fluid only! Be carefull as i needed some force. When the bearing finally gave, it POPPED out and the entire assembly fell to the floor. So be ready! EDIT 4/7/14. Had a 3rd bearing fail. This time i was able to remove without a press. I took two blocks of wood and put the knucle on it with the hub bearing facing down. I backed the 4 bolts out about 1/4" away. I then took a rod of aluminum (to not damage the bolt heads) and a hammer and proceeded to hit the bolt heads around in a cross pattern. Amazingly, the bearing moved, and I was able to hit it out pretty easily this way. Took me all of 2 mins to hit it out and no damage to bolt heads. edit 3/8/16 To date, I've done 3 bearing installs since without using the press in this step. I simply prop the kuckle on some boards of wood, back the bearing bolts out a tad, and then strike them (with an aluminum rod to not damage the bolts) in a criss cross pattern and out they come. No press needed here. Last edited by Mustang5L5; 03-08-2016 at 09:06 AM. The old bearing.....all sorts of grinding coming from this. EDIT: 4/11/2014. Was able to press out old hub. See post #57 on how I did this. Keep in mind, a bad hub could be the reason why the bearing failed. When in doubt...buy a new hub. With the spindle empty, take some time to clean out the hole where the bearing sits. I used a wire brush attachment on a cordless drill, but you can use a hand wire brush as well. I also chose to apply copper high-temp anti-seize here. Hate to say it, but you may need to do this job again at some point. Hopefully, with any luck, the anti-seize allows you to be able to remove the bearing easily with a slide hammer rather than having to press it out. Worth a shot. Take note of the dust shield. It fits on TWO ways, but you want the shield to be positioned away from the rotor and in towards the spindle. So pay attention here! Last edited by Mustang5L5; 04-11-2014 at 10:44 AM. Bolt the bearing on. It only fits one way, so don't be concerned with which end is up. If you can get the 4 bolts in, its the right way. With mine, i could only get the bearing in 1/2way before it stopped. I threaded the 4 bolts in and tightened them evenly in an X-pattern to draw in the bearing. It slid in easy. I could have used the press, but it wasn't necessary. Again, double-check the dust sheild. You don't want to pull this all apart again to flip it. 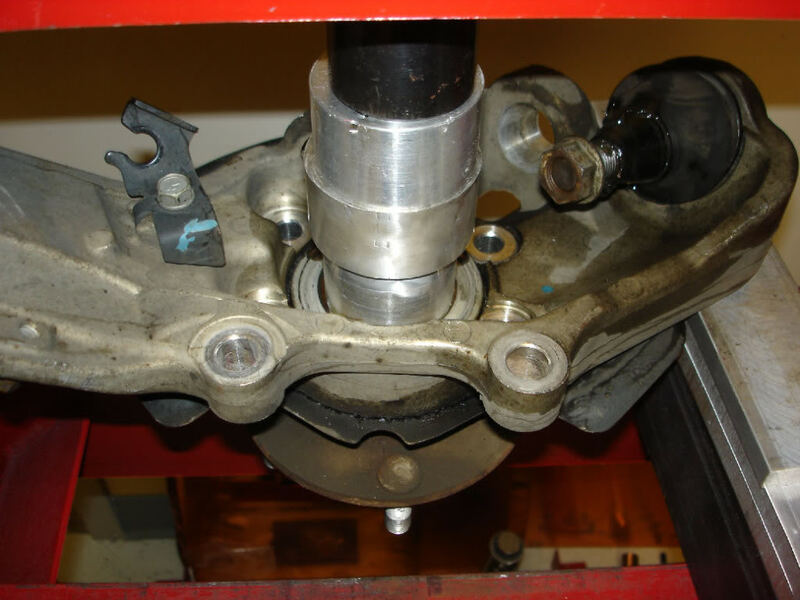 You want it to position it away from the brake rotor and up against the spindle. 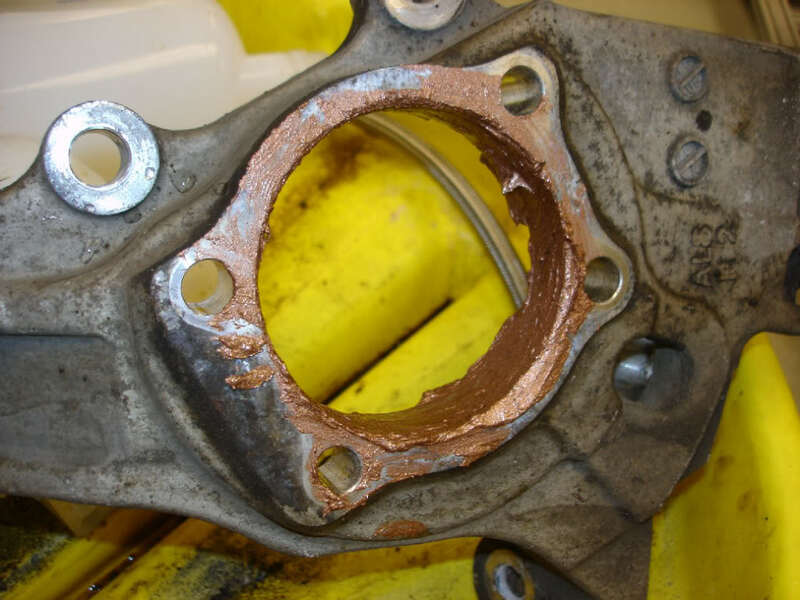 Wipe up any excess anti-seize when done. Last edited by Mustang5L5; 08-01-2011 at 08:55 AM. Hard part done!! At this point, you can prob put it together yourself without help. It took me an hour to reassembly and have the wheel on the ground. it's very easy, but i'll detail it out in steps.